There is plenty to be excited about as a Zelda fan right now. We have new Mario Kart 8 related DLC hitting next Thursday, future DLC packs coming for Hyrule Warriors, extra content thanks to Amiibos, our favorite Zelda characters battling it out against other gaming icons in Super Smash Bros. for Wii U later this month, Zelda U hitting towards the end of next year, NES Remix content, and now Majora’s Mask 3D early in 2015. With so much to talk about you would figure there would be great balances in the Zelda fan kingdom, but instead a lot of focus has been put on Majora’s Mask 3D. We can point to several reasons for this, especially in this community of ours, but a lot of it is likely due in part to our inherent connection to Operation Moonfall, which I and several others have previously stated was a success. As it turns out, the game has been in development before Eiji Aonuma asked for fan support, but that doesn’t mean Operation Moonfall was a failure – rather it means that unknowingly the movement played right into Nintendo’s hands. Operation Moonfall’s biggest accomplishment isn’t getting the game made (it was already happening), but it was becoming the marketing arm for Nintendo. Let me rephrase that just a bit: Eiji Aonuma’s plea for fan support was really a sneaky move to get fans to market a game he already knew they were making for them. It was a shot in the dark to see if fans generating hype and conversations about it, drumming up support, would eventually lead to higher sales than the game might have had otherwise. He did this by only telling us part of the truth – yes a game always needs fan support to be worth making, but he conveniently left out the fact they were making it already. He told us a partial truth, that way us fans could do the work for Nintendo that they seem to do a poor job of themselves at time – marketing and pushing a game into consumer’s wallets. There was some recent controversy when a former employee at Activision openly admitted that Call of Duty was sold on the principle of brainwashing consumers into thinking they want the product. People felt shocked by this notion, but reality is that every game publisher is trying to do just that with the marketing for the game. In this regard, Eiji Aonuma was creating demand and hype around a game that was never promised to be coming; ensuring more fans than might typically want it otherwise will get it when they do bring it out. He brainwashed the fans at that point to want something he already knew they were making, but the consumers didn’t. Now, I’m not saying Nintendo is evil or that Eiji Aonuma was wrong for doing this, but it goes beyond the initial remark. At one point in 2013 he told us he had a choice between an A Link to the Past remake or a Majora’s Mask remake. Again, this was a partial truth, because the choice never existed. They were already doing both – they just turned one into a brand new game. The reason you bring that up is to give the fan movements out there, from Operation Moonfall to various other sects who wanted the title, hope. To add fuel to the fire and keep it burning strong, letting those movements continue to spread free marketing for a title that they still did not promise we would get. At the end of the day it’s on us individually to decide if it this was the best move out of Nintendo and if we’re going to open our wallets to the game next year. 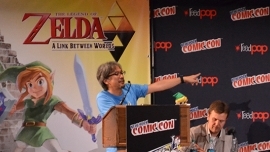 What’s nice about all of this is that it’s never been clearer what Eiji Aonuma was doing. Now that we know this, it might be even easier to read between the lines when he talks about Zelda games and/or remakes in the future. If there is never any outright denial they are making something, chances are it is happening someday. Today I am often asked what is next for Operation Moonfall. All I can say is – what’s next is whatever Nintendo tells us is next. They ultimately, whether they admit to it or not, decide what us fans are going to be clamoring for. Should we be creating hype and demand for the special edition coming to Europe? Is this special edition already coming to the United States, but they wanted to save the announcement for later? This is the sort of stuff we get to ponder now, as Nintendo and Eiji Aonuma are being very cryptic when they talk. The difference now is that we’ve caught Eiji Aonuma doing it. So, what’s next?